Bestselling author Linda Kohanov is beloved for her groundbreaking articulation of “the way of the horse,” an experiential wisdom known to riders for centuries but little studied or adapted to off-horse use. In The Power of the Herd: A Nonpredatory Approach to Social Intelligence, Leadership, and Innovation, Kohanov takes those horse-inspired insights on the nonverbal elements of exceptional communication and leadership into the realms of our workplaces and relationships. The Power of the Herd explores the benefits of “nonpredatory power” in developing assertiveness, fostering creativity, dealing with conflict, and heightening mind-body awareness. We hope you’ll enjoy this interview with Kohanov about the book, which is now out in paperback. Great spiritual and religious traditions teach us to open and heal our hearts. Silent practices of prayer, meditation, and contemplation give rise to an ever-deepening awareness and opening of our hearts. Similarly, poetry written by saints and mystics consoles the heart, helping to open it in a way that is quite unique compared to that of other art forms. 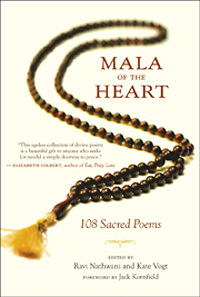 Mala of the Heart: 108 Sacred Poems is a collection of poetry spanning a wide range of cultures and civilizations that celebrates the eternal spiritual truth within each heart. We hope you’ll enjoy this article in which coeditor Kate Vogt shares lessons she learned while working on the book. We hope you’ll enjoy this short video, in which Kim Schneiderman, author of STEP OUT OF YOUR STORY, offers practical insight into how we can view our life circumstances in an empowering light. We also invite you to subscribe to New World Library's YouTube Channel for immediate access to the latest author interviews, book trailers, and more. Increasing numbers of parents grapple with children who are acting out without obvious reason. Revved up and irritable, many of these children are diagnosed with ADHD, bipolar illness, autism, or other disorders but don't respond well to treatment. Integrative child psychiatrist Dr. Victoria Dunckley has delved into this issue, and discovered that everyday use of interactive screen devices such as computers, video games, smartphones, and tablets can easily overstimulate a child's nervous system, triggering a variety of stubborn symptoms. Her new book Reset Your Child’s Brain explores a four-week program she had pioneered to treat what she calls Electronic Screen Syndrome, and produce a life-changing shift in brain function that help get children back on track, all without cost or medication. 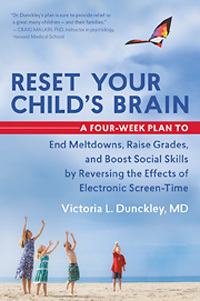 We hope you’ll enjoy this short excerpt from Reset Your Child’s Brain: A Four-Week Plan to End Meltdowns, Raise Grades, and Boost Social Skills by Reversing the Effects of Electronic Screen-Time.